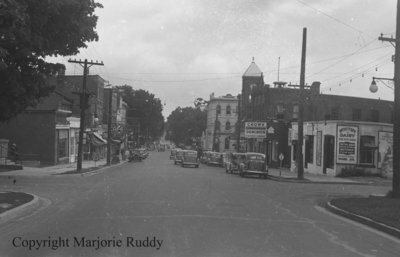 A black and white negative of Dundas Street West looking east towards the four corners (Brock Street and Dundas Street). View from the intersection of Byron and Dundas Streets. New hydro poles are visible on both sides of Dundas Street. Whitby Hydro Poles, c.1939, Marjorie Ruddy. Whitby Archives A2013_040_1012D.